In general, the prospects for the battery-operated train are positive. The range increases proportionally with the continuous capacity increases due to new battery developments. The current prototype is equipped with four BOMBARDIER MITRACtraction batteries and can travel routes of around 40 kilometres – in 2019, the next generation of battery-operated trains will be able to cover distances of up to 100 kilometres on non-electrified railways. In 2019, Deutsche Bahn (DB) will start a twelve-month trial run with passengers with the current prototype in the Alb-Lake Constance region. 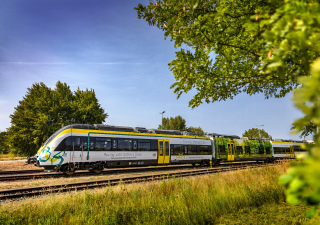 The development of the battery-operated train is subsidised by the German federal government in the framework of an innovation program for electromobility with four million euros. The project partners include the DB Regio subsidiary DB ZugBus Regionalverkehr Alb-Bodensee (regional transport for the Lake Constance region), Nahverkehrsgesellschaft Baden-Württemberg (Baden-Wuerttemberg Regional Transport Company) and the Nationale Organisation Wasserstoff- und Brennstoffzellentechnologie (National Organisation for Hydrogen and Fuel Cell Technology) and the Technical University of Berlin.